I recently heard about Angela Latti and decided to do a google search to find out more about Angela's music. It was a pleasant surprise to see that she already registered her domain name. I got all the information about her, directly from her website. 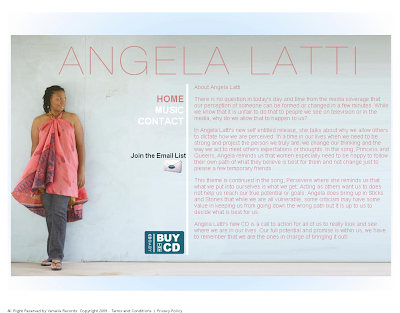 The other really important feature of Angela's website is the CD baby link,If I want to purchase her new album. In my opinion, to be considered a serious artiste, a domain/website is important and should be a part of any promotional package. Remember, a domain is your very own media platform. It should be the first source of information for your fans, media, etc to be updated on what is going on with you as an artiste. For example, Kevin Lyttle.